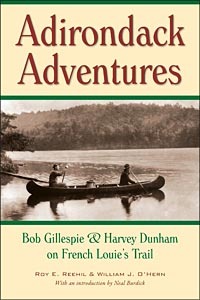 What inspired Harvey Dunham to write his classic book Adirondack French Louie? What was it like to camp, fish and backpack deep in the Adirondacks a century ago? Find the answers to these questions in the extraordinary photo-journals and biographies of Harvey Dunham and his friend and mentor Bob Gillespie. Travel by train to Beaver River and then north along the Red Horse Trail in 1919. Wander into French Louie's old haunts in 1924. Outfitted with tall leather boots, felt caps, canvas tents and pack baskets they journey to remote mountain ponds, fill their creels with trout and share laughs and fireside stories. Illustrated with over 240 never before published period photographs and maps. Adirondack French Louie by Harvey Dunham. All content © William J. O'Hern and the Forager Press, LLC unless otherwise noted.